We are a leading provider of geosynthetic and geotechnical engineering design services across Texas and Oklahoma. GeoSolutions provides site development engineering services throughout Texas. With expertise in local, state and federal projects, as well as private land development, GeoSolutions has the knowledge and experience in a wide variety of project types including retail/commercial/office developments, recreational facilities, multi-family and single-family residential communities, and mixed-use developments. Our staff of professional engineers strive to produce site designs that balance the needs and budget constraints of our clients while adhering to the design requirements and standards of the regulatory agencies. Working closely with our clients and local and state review personnel we strive to produce construction documents which meet our client’s expectations and the regulatory requirements of the communities in which they are located. Design services include site grading, roadways, floodplain analysis, water and wastewater systems, storm drainage, stormwater management, and water quality facilities. During construction, we provide construction observation of the improvements to insure contractor’s compliance with the construction documents. Our approach to site development services is based on our keen understanding that the time frame for project performance is short and that regulatory profiles of site development have increased in the jurisdictions we serve. Continuous client and team involvement is the key to maximizing the functional and marketable success of site development projects. GeoSolutions Inc. offers geosynthetic design services for any approved application. These services identify and evaluate applications for geosynthetic products for use in construction projects. Our expertly conceived geosynthetic designs ensures that the correct products and proper procedures are identified for any given drainage, erosion control, roadway, reinforced soil structures, or containment application. We can help you avoid costly and time consuming issues created by selecting the incorrect product or installation procedure for your project. Once the project is underway we will provide supervision and inspection to insure proper installation. GeoSolutions Inc. provides jobsite inspection services for any project involving geomembranes, geotextiles, and geogrid products. We will observe the work in progress to assess compliance with the Final Cover System criteria, Contract Drawings, and Technical Specifications. We will verify that the equipment used in testing meets the test requirements and that the tests are conducted according to the standardized procedures defined by this QA/QC Plan. We will prepare all required inspections reports as well as promptly report work that is not of acceptable quality or that fails to meet the specified design. GeoSolutions Inc. offers complete soil liner installation supervision as well as evaluation report services to our customers. 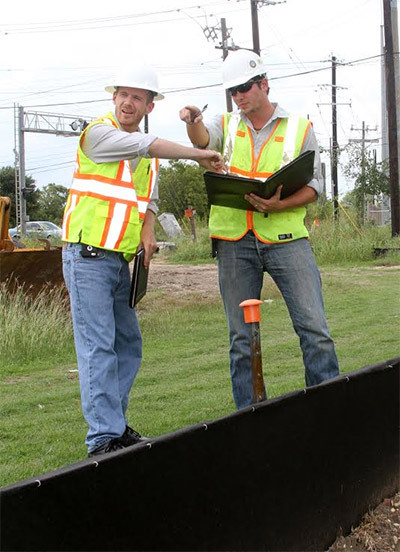 Our staff of Texas registered Professional Engineers (PE) are skilled in geotechnical engineering and soils testing and are fully qualified to provide your project with the required Liner Evaluation Reports and testing. We will handle both the submission and response for Liner Evaluation Reports to the TCEQ. GeoSolutions Inc. is a leading provider of geosynthetic flexible membrane liners and other geosynthetic products used in hazardous waste landfills, impoundments and other installations. These products are frequently referred to as “geomembranes”. We offer complete QA/QC plans for your project to ensure the proper use of our geomembrane products of both HDPE and LLDPE types. Our QA/QC Plans will ensure that all parties that are participating in the installation of geomembranes adheres to the proper and accepted procedures and standards for production and installation of the soil liner. The proper installation of geomembranes is a team effort involving a wide range of project participants. We will ensure that communication and coordination between all parties is maintained and proper records are prepared. We provide the engineering and design details to develop a site in accordance with Low Impact Development (LID) standards. By providing solutions using Green Infrastructure techniques and products, we can create LID systems that reduce impervious cover, help treat stormwater close to the source, and create a sustainable system that maintains a watershed's hydrologic and ecological functions. We provide designs for permeable pavements, bio-retention, storm water filtration storage and re-use, infiltration basins and green roofs. GeoSolutions offers many design options for retaining wall applications. With over 25 years of retaining wall design experience in Texas, GeoSolutions has the expertise to provide the right wall design for the right application. GeoSolutions has designs which employ different wall facings, geometries and reinforcement methods, so that, based on site specific considerations, the client gets the best wall for the job. GeoSolutions provides flexibility in materials and design methodologies while also providing stability in structural design. GeoSolutions will provide complete, affordable storm water compliance services and consulting for your project from start to finish. Let us manage the environmental aspects of the job so you can focus on getting the job done! GeoSolutions is your best source for construction storm water compliance services. We are an industry-leading firm that will prepare and implement a complete, affordable, and precise storm water compliance program for your construction project. SWPPP’s – GeoSolutions provides complete, site-specific Storm Water Pollution Prevention Plans (SWPPP) prepared in accordance with EPA and TCEQ storm water regulations for construction activities. We begin by reviewing your project and preparing a site-specific SWPPP. Our SWPPP’s are generated from careful review and evaluation of your construction project plans to ensure compliance with Federal, State, and local environmental regulations. Storm water Permitting Services - are included in your SWPPP and compliance program. GeoSolutions will determine your permitting requirements with Texas Commission on Environmental Quality (TCEQ) and other local regulatory authorities. Not sure if you need a storm water permit? Let us help. Our expert staff can quickly determine which type of permitting your project requires. We will prepare your TCEQ Notice of Intent (NOI) application and track it through the TCEQ approval process to ensure adequate and timely coverage. We will also prepare the Notice of Termination (NOT) when the project is complete. Site Inspections and Monitoring - We provide thorough site inspections to identify possible sources of pollution and ensure that sediment and erosion control measures are operating correctly. Regular site inspections and appropriate reporting are required by EPA, TCEQ, and local jurisdictions. Some local regulatory authorities also require that inspection staff are certified. Our inspection staff is properly trained and certified to provide adequate and precise storm water compliance inspections. Our certifications include Certified Professional in Erosion and Sediment Control (CPESC) and Certified Erosion, Sediment, and Storm Water Inspector (CESSWI). Reporting – Proper inspection reporting is also required to maintain SWPPP compliance at a construction site. Our inspection reports are promptly prepared and delivered to the appropriate recipients within 24 hours of each inspection, often sooner. Our reports are easy to read and customizable. We also keep electronic copies of each inspection report for your recordkeeping. Proper Postings and Signage - GeoSolutions will post and maintain the proper documentation at your construction project. A TCEQ Construction Site Notice (CSN) with applicable site and permit data is required to be posted for the duration of the project. We will prepare, post, and maintain the appropriate CSN and permit data on a weather-resistant sign at your construction project. The posting is checked at each inspection and updated if required. Regulatory Assistance – State and Federal environmental construction regulations can often seem “grey” and somewhat confusing to interpret and implement. GeoSolutions’ staff has over 18 years of experience in environmental consulting for the construction industry, and we consider ourselves experts in the industry. We strive to remain knowledgeable and adept with current and upcoming guidelines in order to provide unparalleled expertise with top-notch customer service. GeoSolutions has built ongoing relationships with many developers, contractors, home builders, civil engineering firms, and regulatory agencies throughout the state of Texas. Our positive reputation was founded on knowledge, timeliness, experience, affordability and honesty. Choose GeoSolutions with your next project and see why so many of our clients rely on us for their environmental compliance requirements. GeoSolutions offers design services for streambank and channel restoration, ranging from conducting full Geomorphic Assessments and determining optimum channel configurations to taking simple erosion control measures and formulating strategies to stabilize a channel or stream. We typically consider the degree of current channel stability and generate designs to create a stable channel environment. Channel plan and profile may be modified or preserved to fulfill an interrelated project scope. This encompasses creating adequate flow characteristics while providing for efficient sediment transport without excessive scour or sediment deposition. GeoSolutions specializes in the utilization of Natural Channel Design principles to construct stream improvements with natural elements and vegetation to enhance riparian zones. Our streambank stabilization clients range from municipalities and land developers to homeowners and ranchers. A Geomorphic Assessment would be conducted of the project waterway to determine the degree of current channel stability and to consider how to create a stable channel environment as a result of the project design. The channel plan and profile would be modified or preserved to the degree possible to fulfill an interrelated project scope. The goal would be to create or preserve stable channel dimensions, pattern and profile, such that the channel would have adequate flow characteristics while providing for efficient sediment transport without excessive scour or sediment deposition. To the extent possible attempts will be made to construct stream improvements with natural elements and vegetation to enhance riparian zones. The use of Mechanically Stabilized Earth Structures or Rock/Earth Anchored Structures is typically utilized to improve stream geometry. GeoSolutions provides a wide range of comprehensive engineering services related to trench safety plans and site specified engineered excavation safety systems which meet OSHA standards. Our in-house Professional Engineers can develop the most cost-effective and secure excavation shoring plan designed specifically for your project. For complex excavations, engineered systems are a great way to minimize installation costs without compromising safety or efficiency. The design process begins with a review of the project details and the identification of risk factors that may affect the design along with soils reports and any pre-chosen selection of the protective system by the client. Our engineers then perform a comprehensive design analysis to determine the best most economical shoring system. The end result is the creation of a detailed plan that is specific to the particular project which is safe and productive. BMP and Pond Routine Maintenance – We will provide all necessary routine maintenance, consisting of managing vegetation, trash removal, cleaning and replacement of filter elements and media. GeoSolutions offers popular webinar sessions free of charge to businesses in our region. You can pick any topic you like along a broad range of topics including soil stabilization, retention, erosion control, and more.